Back in January when I laid out my resolutions for 2014, one unspoken resolution was clear to me - don't buy any new gear. I didn't need anything new and I was already under using what I have. That is still the case and I have used quite a few of my cameras already this year and lining up future projects for the ones I haven't. It's exciting. Then I saw an eBay auction that added a camera to my collection. Damn! To back up a little bit here, James Pearson, Simon Kidd and I all keep in touch via a group text message - chatting about what we're doing with our film photography and answering each others questions. It's not all we chat about but it's the main thing we all have in common - that and fatherhood. I received a text message from James with an eBay link to a 5x4 film folder - it was a great price...a bargain...but I was firm in my plans for the year ahead. I knew large format would be where I would be heading in my photography because I love landscapes and the time and control large format photography offers is appealing to me. But not yet. I have a medium format camera that offers me great satisfaction. I was content. Simon stepped forward and offered me the use of his Graflex Crown Graphic for a while to see what I thought and suggested ways to process black and white sheet film without renewing my developing gear...which I would need to do if I made the move. Where do I go from here? All I'm investing in is a cheap film holder. What is there to lose? I bought two film holders off the guy on eBay since he had a few, as did James, but they turned out to be the wrong size - 9x12cm instead of 5x4". I was already learning new things. I was still committed to finding the correct film holder, at the right price, and giving large format a go. Simon then sent a text saying he has spotted a Speed Graphic on eBay for £45 and it grabbed my attention instantly. It was clear the large format bug had already bitten. After some haggling, I had bought a large format camera. The camera is an Anniversary Speed Graphic built in the 1940's and it needs some work but, after seeing it, not as much as you might think - not to warrant a £45 price tag or even the £40 I actually paid. It was advertised as a project that the seller had started and then gave up on. The ground glass had been broken but he had replaced that with a new one, and the bellows were burst and beyond repair. It had no lens but he was offering this at a reasonable price so I bought that too. Total price £85. When you look at the camera you have to agree that it has seen better days but, then, it's 70 years old - I'm sure I will be saying that about my own reflection at 70 years old. The leather is dry and peeling and there is some stiffness in the movements. That a side, it is a complete camera for the best part and there appears to be very few missing parts that can't be replaced and certainly don't stop the camera working. I've thought a lot about this camera in the last couple of weeks - about what I will do with it to get it up to scratch and usable. I've asked James and Simon, naturally. A restoration wouldn't be simple enough from what I've read and some kind of custom modification would also be simple, but the main thing for me right now is to get it working and that requires a new bellows. I'll no doubt be posting about my progress with this camera over the coming months. I don't know when I'll take my first exposure with it but you'll certainly hear about. Until then I have plenty of other cameras and film formats to keep me busy. 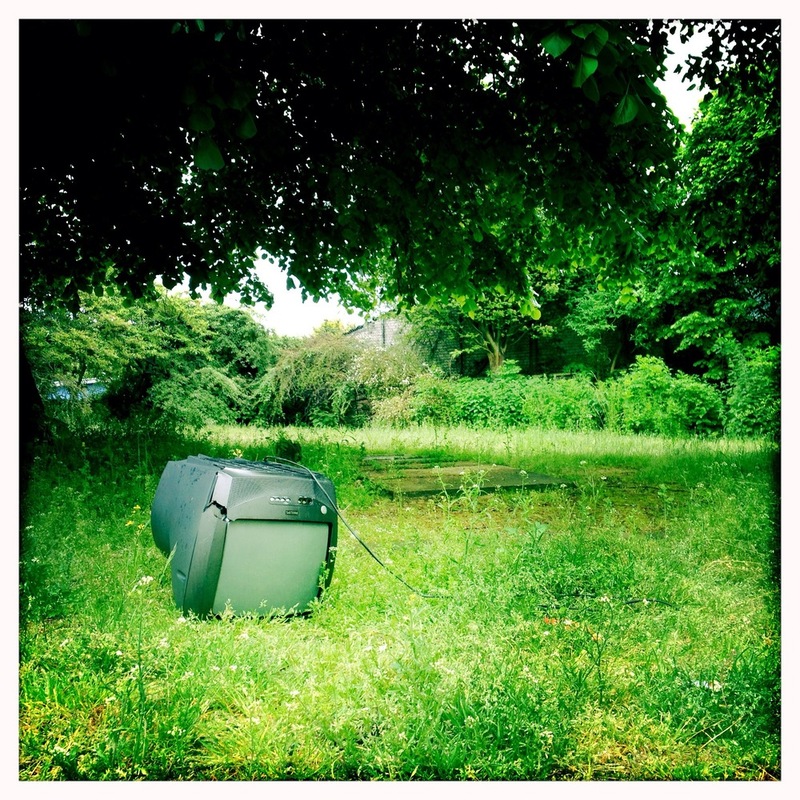 Abandoned TVs started as a bit of fun on Instagram but has become an obsession for my walk to and from work. Rarely a week passes where I don't spot a TV at the roadside or beside a bin so I thought I'd share some of my favourites and talk a little about where I see the project going. The first photo I ever posted of an abandoned TV is above but it actually started before that when I spotted a TV sitting on a table with a lamp beside it at the roadside. I became interested in the idea of urban still lifes like this - objects gathered together (usually on bin collection day) at the side of the road outside of their usual surroundings - but what I actually started to notice were more and more TVs of different ages and styles. As I said, it was a bit of fun - I started off spotting two or three a week and posting my favourites on Instagram but I have never stopped seeing them and it is fast approaching a year since I started. I don't post them all as some of them are just not interesting but I've included some of my favourites of what I do post below. As the project has grown I've made plans to move it into my film work - specifically my Holga as it matches how much I enjoy shooting with the Hipstamatic app on the iPhone. I've taken a few on my 35mm camera as well which I enjoyed as it allowed me to play with depth of field but there aren't many at this stage. There is part of me that really likes having this on Instagram though so it will remain there for the time being, but to have this join my film work would probably please me more and I hope to have that happen in the future. Until then, if you're not following me on there already and would like to see more of this random project of mine then please feel free to add me (my username is "iainkendall") and let me know what you think. 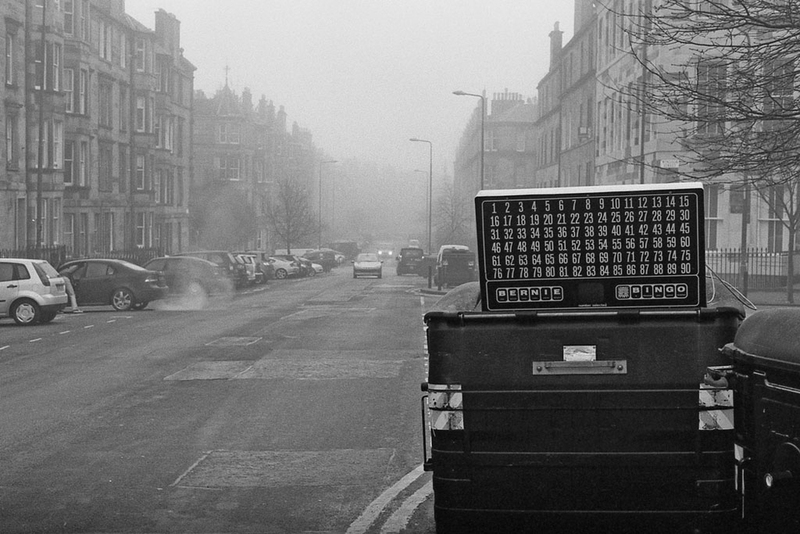 I took this photograph last year whilst walking through a residential area of Edinburgh. I had actually spotted it the night before and snapped a shot on my iPhone as it was incredibly bizarre to see a bingo machine dumped on top of a waste bin. It got me thinking about who had it in their house and what events had taken place to for them to suddenly throw it out. The next day, praying it was still there, I returned with my Pentax SP500 to take a better picture. Fast forward to earlier this year and I receive a message from Adam McCrory on Flickr, "my dad used to make these". I immediately went back to him to find out more. Charles McCrory started as a TV engineer back in the seventies and made a device called a Stage Safety Unit after a friend of his was electrocuted on stage. From there he ventured into raffle machines called Spinners and then finally into bingo machines and creating the BERNIE (Bingo Electronic Random Number Indicator Equipment). It was very successful but unfortunately the recession of the eighties worked against Charles and he eventually stopped production around 1984 and closed his business. He was the millionaire that should have been. "What I love about your photo is it captures one of his greatest achievements (creating the BERNIE) and the subtle irony that it's ended up in the bin - it sums up his life in a strange sort of way"
I was touched that Adam shared the story with me - it turned a random object that I thought was "kind of cool" into something that mattered. After I first saw this bingo machine, I started to take more photographs of the random things I pass everyday, but hearing the background of it makes me look at them differently and consider the history of what I'm taking pictures of. It is proof that no picture is pointless as it will always mean something to someone. Sadly Charles died on the 17th February 2011 and when looking at the iPhone photograph that I took the night before I noticed that it was dated the 16th February 2011. The next day, when Charles died, was when I returned to take the photograph above.